Welcome to Covington Savings & Loan’s Internet Banking enrollment. 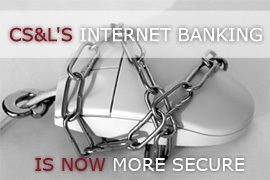 Internet Banking is Free! You must have an established account with Covington Savings & Loan to enroll in Internet Banking. We look forward to serving you. Covington Savings & Loan is working hard to secure our online banking services so that you, our customer, have the confidence that your information is being protected. A multifactor authentication method is used to recognize you as an authorized user by verifying multiple identifying details. This method provides a high level of protection against fraudulent attacks such as phishing, spoofing, key logging, and identity theft. All users will be required to select challenge questions and answers, select a unique image, and create a personal description for the image that is known to you alone. Each time you log in, the selected image will appear, verifying that you truly are on Covington Savings & Loan’s website before entering your password. Another level of security is the authentication of your computer. We have the ability to recognize the computer or computers from which you usually log on. If our system detects a suspicious login due to an unfamiliar computer, it will automatically present you with challenge questions that you previously selected. Step 1: Select the FIRST TIME USER button. Step 2: Complete the enrollment page and select SUBMIT. Step 3: You will receive two separate notices via US mail in the following 3-5 days containing your ACCESS ID and PASSWORD. Step 1: Log in using your ACCESS ID and PASSWORD. Step 2: A PICTURE from the image library will be selected for you. Customization is available after the initial enrollment. Step 3: Create a PASS PHRASE or personal description for the image. Step 4: Select your CHALLENGE QUESTIONS and provide your ANSWERS. Step 5: Select whether to register this computer. IMPORTANT: For your security, only register personal computers that you frequently use and are not available for public use! The next time you log into Covington Savings & Loan’s online service, we will recognize you and display the image and pass phrase you selected. IMPORTANT: If you do NOT recognize the image and/or pass phrase presented, contact Covington Savings and Loan to verify your online account. If you do recognize the image and pass phrase, enter your password and submit. If you have forgotten your Access ID or password, please call 937-473-2021 during normal business hours. For your protection, DO NOT send your ACCOUNT NUMBER, SOCIAL SECURITY NUMBER, or ID NUMBERS by email.